Renowned artist and Granny Takes a Trip owner Nigel Waymouth is to talk about his 60s poster designs in London this week. 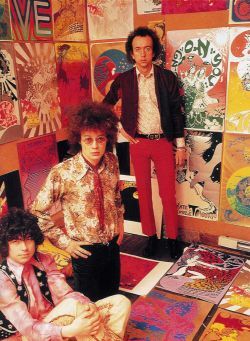 Alongside Michael English (pictured here on the left, with Waymouth in the middle, and Guy Stevens on the right), Waymouth designed the posters for London club UFO and various gigs organised by stars of the counter-culture. He quickly followed this by opening the first ‘psychedelic boutique’, Granny Takes A Trip. It begins at 6.30pm and finishes around 9pm. See more on Waymouth here, and see the Bamalama website here.